I think all three are important, though I’m more comfortable with saving and earning than I am investing. The day will come when I’m better at investing, and that day is just around the corner. I’ve mentioned before that one of my goals for this year is to save 50% of my after-tax income. To me, this goal is really important, because I can remember times not so long ago where I couldn’t save $100 from one paycheck to the next, and frankly, that’s reprehensible. Or at least a little foolish. If, at the end of the year, I can see my bank account and know, really know, that I saved half of my income, I’ll consider that a success. I don’t have a company match, I certainly don’t have a pension, and I am a single woman in my 30s. If I don’t save for my future, who will? My last name is neither Rockefeller nor Walton, so I don’t anticipate “coming into money” when my parents pass away. Which is good, because I’m not ready for them to leave this earth anytime soon. I read enough other personal finance blogs to know for a fact that lifestyle inflation is easy. Especially when you start to have more money than usual, you can feel a little like a high roller when you see four digits or something in your account. Saving half keeps the “happy hour creep” from showing up. Not the guy, unfortunately. I can’t figure out how to keep him away. But I can stay out of the bars more easily when I hide money and see that I only have enough for groceries for the rest of the month, and not enough to spend $20 three times a week with friends. I know some of you (Emily, for one) have targeted savings accounts, and that’s great. For me, though, it’s better to simply save half, live off the rest, and use my savings if I absolutely have to. This one really hits home for me. I mean, am I really working my tail off just in order for some restaurants/grocery stores/hotel chains to make more money? No. That’s ridiculous. I am the person in all of my friend groups that is earning the least. However, that doesn’t mean much at all! My friends are spending more because they have more to spend. That’s fine, and I hold no judgement. But I’m saving more, certainly on a percentage basis. And with some high earning friends, I might be saving more even when it comes to pure dollar amounts. I was walking around a shopping district with a friend who was visiting, and we walked into Diesel. We joked that we were both amazed that Diesel still existed, since neither one of us had stepped into one of their stores in recent memory. He started looking at jeans, so I wandered into the women’s section. I saw a cute pair of jeans — they were dark and skinny, for those of you who must know — and I thought, “I might try these on!” Then I turned over the tag, and saw the price: $228. I knew then that no matter how my income soars, I will never be the kind of girl that spends that kind of money on denim. I used to be frugal out of necessity. When you simply don’t have the money, it’s not an exercise in deprivation for deprivation’s sake. “When I have more money,” I’d think, and fill in all kinds of endings to that sentence. But now? Sure, YOLO, and all of that (does anyone else think of those chocolate covered caramel candies when they see that word? Rolos? no? just me? carry on, then) but life is about more than living paycheck to paycheck. I’d rather skip the $20 meals in order to save up for a memorable trip. And William from Drop Dead Money helped me understand something really important. He said that we are either debtors or investors. Many people get out of debt just in time to want to upgrade something expensive, because making payments on debt is something we’re used to and comfortable with, and the freedom of no longer having any debt is hard and uncomfortable for most. Do you want to build the habits of your millionaire neighbor, or do you want to be like the Joneses? I’m saving in order to switch my mindset. I’m saving because I’m the last of a long line of savers. I’m saving because I want to be comfortable. We’re definitely saving, though not at 50% but pretty darn close. I think it really is a mentality to have that’s focused on saving money. We’d much rather make those wise choices and save money on some things so we can have it for other, more important things. Nice! My boyfriend and I saved 50 percent of our combined income last year … it accelerated our investments by A LOT. I’m a huge supporter of this. I am not saving half, but I am putting more than half of my income towards my debt each month. Once I get out of debt in a few years, I am definitely saving half! Love this article, some very nice points. I don’t technically have targeted savings. I don’t have a fund for a vacation or new car, I just have one lump savings pot. I am trying to save half of our income every month. We are probably saving 40% of our after tax income. I set a goal of saving 50% of my income this year. I actually managed to save 75% of my income last month. This month I’ll probably save less than 50% of my income due to a large tax bill but I’ll still be on track to save 50% of my income for the year. I always read your income reports and am amazed by how much you save each month! Some people enjoy spending money now, but it seems like we are people who value the future over the present. My wife and I hide money too. We automatically have money get transferred into retirement or savings, and so we never really see it. See no money, spend no money! Thanks for the shout-out! You’re saving half your income for the long-term, though, right? Our targeted savings is all for short-term stuff – not investments like William spoke about. It’s really more like layaway spending. We are the underachievers in this crowd, apparently… About 17% goes into our retirement accounts and everything else gets spend within about a year. I would love to get to a point where we can save half or something close – maybe when we are working toward buying a house. Man, you guys rock! In my early 20’s, before I had dependents, I had a pretty high-paying job for my age and saved 25% of my pre-tax income, and I thought that was a lot! I guess, as a percentage of my after-tax income, it was a lot higher. It wasn’t easy, but I don’t remember it being that difficult either because I had such few financial responsibilities at that time. I had the funds direct-deposited into their own savings account, so I wouldn’t be tempted. I think that’s the best way to do it. Since I have my own business now, I find it harder to save as much, because I can’t set up an automated system. I have to say that my sister and brother-in-law operated off of a single salary for years and years, saving the other one in its entirety, and I always thought that was just awesome. Kudos to you, Kathleen, and the rest of you guys who are making it happen! Such a great article. This is exactly what I tell people to do. I usually hate being salesy… but you should study the becoming your own bank concept a bit. It may be a perfect fit for you. I’d check it out if I were you. It’s not an investment, it’s just a better savings account, heads and shoulders over a bank. Great advice though. I think everyone should be saving at least 20 percent. I don’t understand why we don’t have a “save as much as you can” mentality in our country. Definitely needs to be promoted. It would be really nice to save half of your salary but there are still tons of things that needed payments. But I’m saving as much as I can. 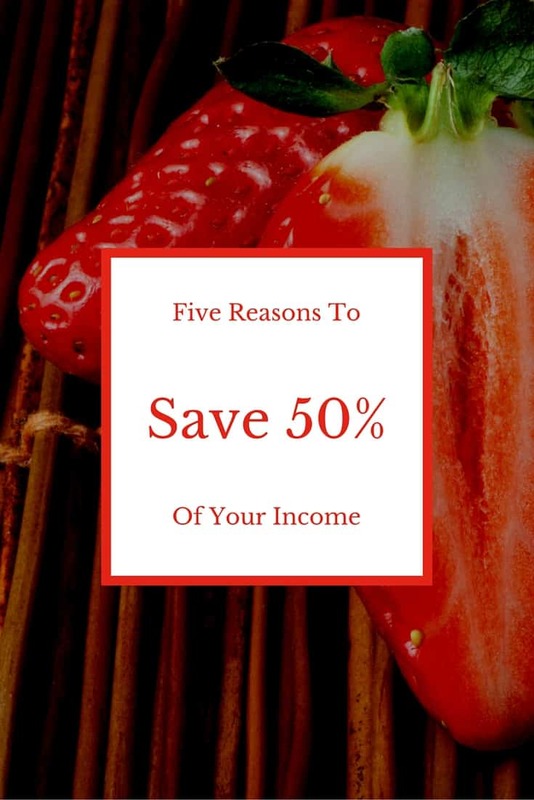 Saving half of your income is probably a dream for most of the people, as it sounds good in theory but living off the other 50% can be extremely challenging. I would probably be happy to save anywhere from 30-40%.